Do the Ethiopian nationalities have cause to celebrate their so called “day” in the Afar region? This year’s Nations, Nationalities and Peoples “Day” is to be celebrated in December 2017, in Samara, the capital city of the Afar Region. The forthcoming is the 12th round of those Jamborees prepared in the name of EthiopianAfar regional map, Ethiopia Nations, Nationalities and Peoples “Day”. A brochure issued by the federal authorities’ states that Nations, Nationalities and Peoples day is celebrated in “commemoration of the people of Ethiopia’s ultimate triumph against the repressive and oppressive regime that had deprived them of their rights in their own nation”. They are of course, referring to pre-1991 oppressive regimes and not the present regime. The Ethiopian Nations, Nationalities and Peoples are being deprived of their legitimate rights and fundamental freedom and liberty by the current regime in their own nation. This is the tip of the ridiculous mockery that provoke outrage and wrath in those regions in particular and the whole country in general. It is not only” the peace between its people” that is conspicuously and unmistakable absent in those days between Ethiopian peoples. This huge Carnival Festivities of this round of Nationalities “DAY” will be celebrated massively, while 99% of the Afar population do not have basic necessities of life, such as water, food, clothing, shelter, housing and healthcare. Meanwhile, thousands of Oromo citizens who were displaced from Ethiopian Somali Region are being tracked in Lorries and freight to safer places in their home region, namely; Oromia. 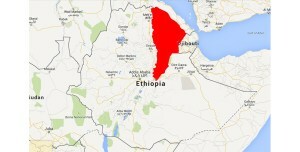 It is reported that 50,000 Oromos were so far displaced from Ethiopian Somali Region. The scene looks like any African civil war dramas we are all familiar with. Somalis are displacing Oromos from Jijiga only but from neighbouring Somali Republics like Somali-land & Punt-land. Here in Ethiopia Konsos fight Burjis, Afars fight Issa- Somalis, Amharas fight Tigrais in Wokayet-Tsegede and Neuers fight Anwaks and so forth. It looks as if it is every body’s war against everybody. Settled farmers against cattle herders, natives versus new-comers and so forth. Everybody seems to be at each other’s throat. Allowing the so called Liyu Hayle (Liyu Polis) armed militias of every regions to engage in illegal acts of armed aggression to occupy each other’s territories by use of force is a serious disaster especially when the local militias are under ambitious and out of control local prospective war lords are in collusion with greedy TPLF army Commanders. The so called Liyu Hayle forces, in all regions, have categorically failed to maintain law and order, peace and security within their local jurisdictions. As a result of TPLF failed policy and bad governance the recurrent clashes are crossing the threshold into full- blown bloody civil war. In spite of all those upheavals, the preparation in Afar land is being finalized for the forthcoming “Day” of Nationalities under the slogan “peace among its Peoples.” The Festival flyer states that the stadium, collection hall, internal roads and other infrastructure constructions continue to be build. The Festivities Preparatory Committee making the poor Afar people to donate money and livestock. The Committee announced that 701 camels, 10,513 goats and sheep and 175 cattle were received from Afar herders. This is from a Region where people live on handouts from the central government because of the recurrent drought, man-made hunger, oppression, discrimination, gross human rights abuses and deprivation of economic and social development packages. The ruling officials of the Afar region are proud to build “1 Stadium” for 1 billion and 600 million Ethiopian Birr, while their people are facing unprecedented severe economic and social hardship and health problem. Afar region is the most neglected, marginalised and underdeveloped regions in the country. Investors are called upon to invest in the Afar Region. The Afar Diasporas are also invited to come to celebrate the big “Day”. We are told delegates were even sent to European capital cities, such as Brussels and London to convince the Diasporas Communities to attend the Festival. Everything is ready for the big Jamboree but the only conspicuously absentee is the “peace and development” which they are supposed to “celebrate” on “their Big Day”. The Ethiopian Nations, Nationalities and Peoples have little to “celebrate”. Above all, the Afars of all groups have definitely little cause to celebrate. Afars will join their fellow Ethiopians in Samara in displaying their music and dancing in their traditional dress and decoration but having little to pay tribute to. On the contrary, today they are all busy in bundling together to get rid of this called TPLF, while TPLF which in turn is busy in hoodwinking everybody in its irresponsible behaviour of instigating one group against another group to maintain its divide and rule policy. They are deliberating in Mekelle City, the capital of Tigray State on how to refine their “divide and rule” machinations. But, the Ethiopian Nations, Nationalities and Peoples have too little “to celebrate on the so called “Nationalities Day” but every cause to stand and rebel in unison to uproot TPLF/EPRDF, the cause of all their misery and calamity. Long live the Struggle of Ethiopian People!